Shiny Party is a cute pre-school app that helps children learn their shapes, colors, practice patterns, and match items in a fun virtual environment. With a variety of activities that can be completed separately or within the story, this app is great for young children as it provides many options for learning. Shiny Party has an easy to use interface that pre-schoolers will enjoy as soon as they open it. Not only are there creative illustrations within each activity, but the interactive component of the illustrations is something young children will love as they bring the images to life. The bright colors and patterns the developers used help to enhance the visual appeal of the app as well. The narration, music, and sound effects that are used throughout the games and story portion of the app are clear and help to enhance quality of the app very well. Overall, the developers have done a great job incorporating high quality illustrations and audio to create a fun learning environment for young children. While children will certainly be having fun with this app, they will do so as they learn a variety of skills. 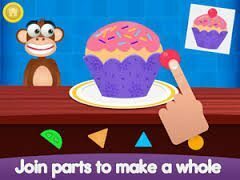 The four activities included in this app include finding shapes, building cupcakes, shape puzzles, and a matching activity. Not only will users learn their shapes, but they will also be able to recognize various colors as well as practice their reading skills in “story mode” using the narration and text highlighting features. Shiny Party is certainly a great educational app, but it is also fun for children to play. Children will not only use their creativity to build cupcakes, but they will also have fun coloring in various shapes, putting together puzzles, and reading through the story as well. And if all that wasn’t enough, each illustration within the story allows them to interact with the characters and bring certain images to life. Shiny Party has a lot to offer little ones just learning their shapes and colors and the interactive story and illustrations make this app a must-have. Priced at just under two dollars, this is a pretty fair deal for everything you get in return. Not only is Shiny Party easy to use, but it is safe for kids too. All of the areas that are for parents only are protected so children have to tap a specific shape for a certain amount of time to gain access. Considering most children that will be using this app are going to be pre-readers, this is a great way to protect them from any social media links or additional apps. With that said this is a great child friendly app for kids.